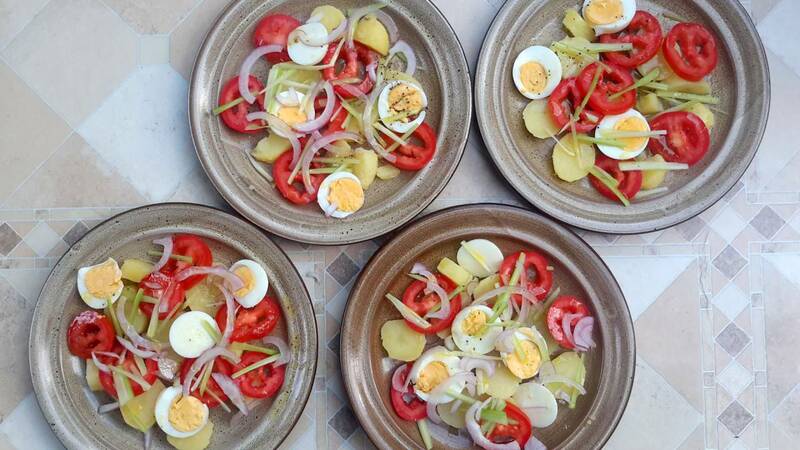 When you make a salad at home, it has a tendency to end up as Iceberg salad with tomato, cucumber and onion. Fortunately, there are a lot of simple and very good French classics to be inspired by. Julienne: Typically cut into pieces the size of matchsticks. Can be larger sizes though. Vinaigrette: dressing made of 1 part vinegar / 3 parts oil and mustard to taste. You can use lemon instead of vinegar. Salt and pepper to taste. Use plenty of salt, there has to be enough for all the lettuce. Worcestershire: pronounced "Wooster". Ready made sauce. Truffles: you can use truffle oil. It's easier to get a hold of and somewhat cheaper. Potatoes: use the most waxy ones you can find. As a rule, the smaller varieties are typically used. I have tried to find out where the names of the salads originated. I may have been wrong, let me know if you know more than I do.